The system is designed to fully refine, i.e. degum / neutralize, bleach, strip and deodorize and dewaxed oils. The Degumming / Neutralizing System are used as the first step in chemical refining referred to as Neutralizing. This step will generally produce oil with lower levels of residual phosphatides and less residual pigments and therefore require less bleaching earth in bleaching as well as help generate finished deodorized oil with a lighter color and longer shelf life. The Bleaching System is based on treatment with bleaching earth followed by filtration. Waxes are removed by cooling the oil in the crystallisers followed by filteration. 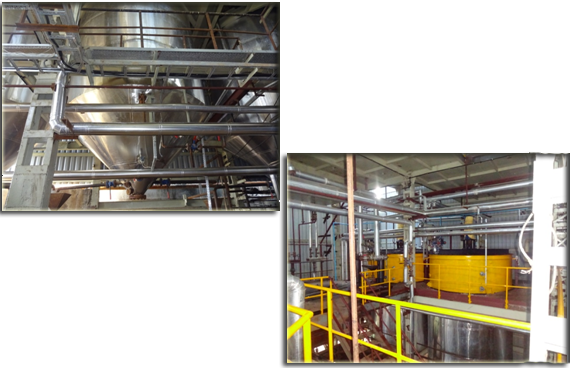 The High Efficiency Deodorizing System can be used for deodorizing of neutralized oils as well as stripping and deodorizing of high FFA oils as part of physical refining. To redue the color of vegatable oil bleaching the oil is obtained from perviovs stages contains traces of soap, Colour pigments,phosphs lipids etc. this oil is mixed with activated earth to from a slurry .the slurry is dried under vaccum and then filtered to get clear bleached oil. The required stirring is maintained by open steam sparging. 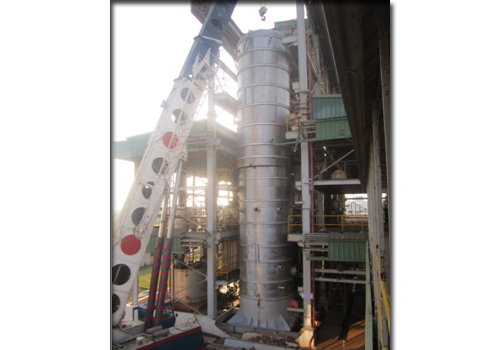 During steady operation ,the deodorizer shell is maintained at 2 mmabs vaccum.the hot oil from pre-heater drop into the per-stripping section with open steam sparging. 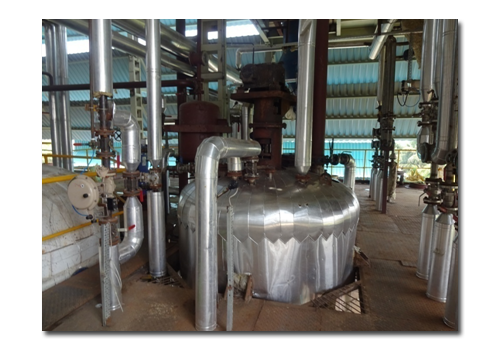 The carrier steam takes away all volatil components present in the oil like fatty acid,tocopherols,sterol,acteones,aldehydes etc these are recovered in the fatty acid condensing system provided in the plant design.